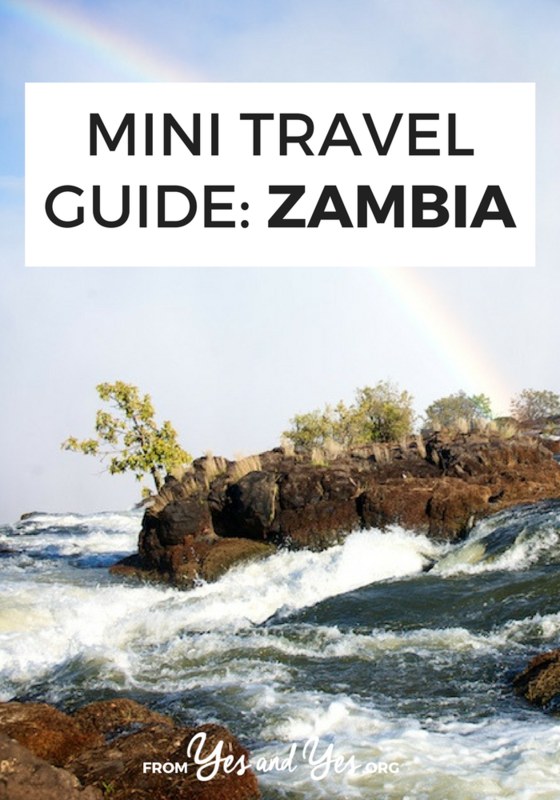 Looking for a travel guide to Zambia? We all know the best travel tips come from locals, so I’m thrilled to introduce you to Twaambo and her suggestions for the best things to do and eat and see in Zambia! Hi! My name is Twaambo, I’m a Zambian girl who dearly loves her home country. I was born in the capital Lusaka, and lived there until I finished high school and have globetrotted since then. Landing at the airport is like putting on an old comfortable house shoe. We just fit! One of the seven wonders of the world, this is one of the things that Zambia is best known for. The lovely spray of water (depending on when you visit) leaves you refreshed and surprised, and swimming in the ‘Devils pool’ (amongst other thrilling things you can do at the falls) is for the daredevils! The world’s longest freshwater lake! It boasts amazing waters, magnificent sunrises/sunsets, great birdwatching and fishing. If you’re looking for a peaceful, tranquil stay in the African bush, this is a gem. Read a book, seated in a three walled chalet (yes, it stays like that all night, and, no, nothing will come and get you!) You can also try activities like hiking, biking, horse riding, and swimming in the clear rivers. Of course you have to bungee jump of the knife edge bridge at the Victoria falls! It’s a 111m drop and a breathtaking view! Adrenaline anyone? Take the train from Kapiri Mposhi all the way to Dar Es Salaam (Tanzania). Enjoy uninterrupted views of Zambia, bring a book, an ipod and patience, as the train does not always run on time! Watch the kids wave at you from your window and be surprised by the elephant or giraffe as you chug through some national parks as you go through Tanzania. If a train ride with fine dining is your thing, the Royal Livingstone Express may just be it. The journey runs parallel to the Zambezi River. Guests have the opportunity to catch glimpses of elephants, birds, other wildlife (even the white rhino!) As it gets darker, guests are invited to a lavish dinner in the lush dining cars. This is the local staple food (like polenta!) that you can eat with various vegetables, meat or fish. Eat it with pumpkin leaves (pumpkin leaves and groundnuts, yum!) and a side of fried bream (fish). Also you must eat with your hands! Why not try something out of the box? Caterpillars are tasty and a good source of protein! They are sold dry and you can eat them as is, or fried crisp, or with onion and tomato.They pack a whopping 31 mg of iron per 100 grams. This is a vegetarian meatloaf made of boiled orchid tubers and peanuts that’s affectionately called the African/Zambian polony. You can also find this for sale in the markets, just a little chilli and you have a delicious snack to go. Zambians are very nice people that are pretty open about talking to people, but don’t like confrontation. Striking a conversation is easily done but if someone gets annoying simply state your place and walk away. As in every country you visit, one must be careful with personal belongings, especially around markets and crowded areas. Numerous long distance bus routes are available to get from the Lusaka to most parts of the country (especially tourist spots). Your lodging should be able to give you insight on the best way to get to them. Feel free to ask the locals for recommendations. Like most countries, Airbnb is cheaper and more ‘authentic’ than a hotel. This entire house with a pool is $30 USD per night! If you’ve never used Airbnb before, here’s a $40 credit towards your first booking. Buses and taxis are widely available, just double check with a local of the actual price as on some rides you may pay ‘tourist tax.’ Public buses do not run much later than 11 pm, and then taxis are your best and safest option. Thanks so much for sharing, Twaambo! Have any of you guys been to Zambia? Any travel tips for Zambia to share? P.S. I rounded up all of my favorite travel tips here. Wow looks amazing! I love the last picture with the elephants. I would love to visit one day. Wow, so beautiful! I had to look up on the map where Zambia is. Thank you for this mini guide! Wow, gorgeous pictures! A friend of mine spent a summer in Zambia, and I have begged her to take me with her when she goes back! Zambia is one of my favorite places I have ever traveled. So AMAZING! Yay!! Glad you loved the post! Thank you Sarah for the feature! Hope that everyone can make it one day and have a good time!